3. That neither I nor any other member of the household (household means a family consisting of husband, wife, unmarried children, dependent parents, living together in a dwelling unit having common kitchen) possess any LPG connection from PSU Oil Companies or Piped Natural Gas connection, for domestic use. a) NAME OF THE DOCUMENT(S) as proof of residence. b) NAME OF THE DOCUMENT(S) as proof of identity. 6. 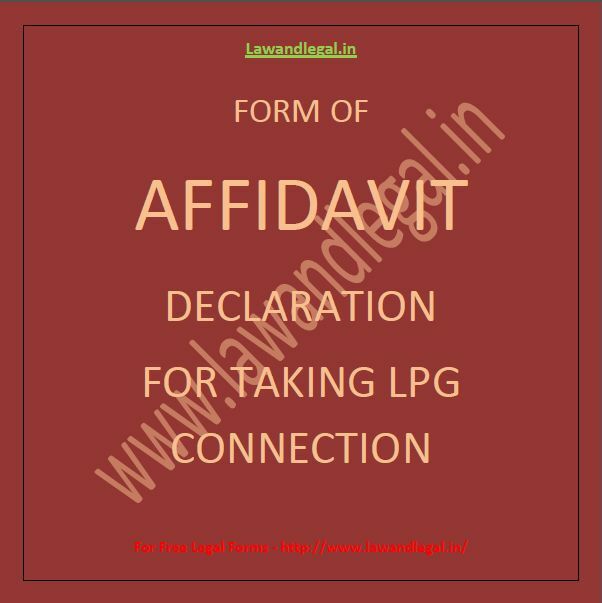 I confirm that the LPG connection issued to me will be used in my above-mentioned address and for domestic cooking purpose only and I shall abide by all terms governing its use. 7. That I shall not position any other LP gas installations in the same kitchen. 8. That as and when second cylinder shall be issued to me against this connection the same will also be used in the same kitchen and with the original installation. 9. That whenever I change my residence from present address to another, I will inform the same to NAME OF THE DISTRIBUTOR / RGGLV in writing in advance for change of address in the records. 10. 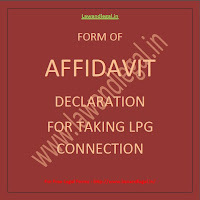 That if any information / declaration given be me herein or any document submitted in support of identity / residence proof shall be found untrue or incorrect or false, Hindustan Petroleum Corporation/ Indian Oil Corporation/ Bharat Petroleum Corporation (Delete, whichever is not applicable) would be within its rights to withdraw the supply of Gas / terminate the connection /seize the equipments / forfeit the security deposit and that I would have no claim, whatsoever against Hindustan Petroleum Corporation/ Indian Oil Corporation/ Bharat Petroleum Corporation (Delete, whichever is not applicable) for such withdrawal /termination /seizure /forfeiture. 11. I hereby declare that whatever has been stated above is true to the best of my knowledge, correct and nothing material has been concealed therefrom. I sign this declaration on this th day of December, 2012 at Kolkata.